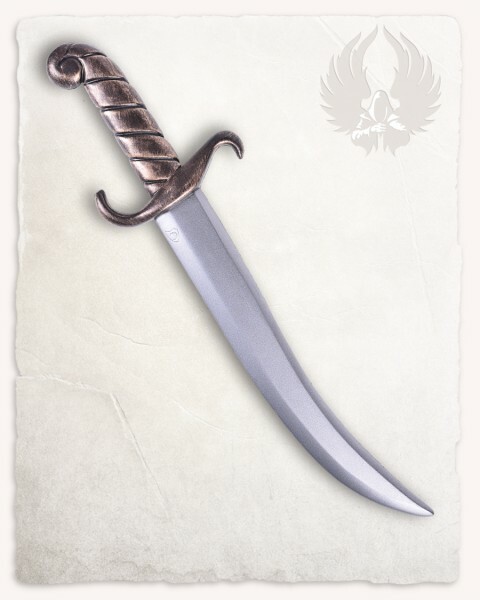 Created for middle-eastern characters in mind, this dagger is perfect for any agile or quick character. Its curved design makes it perfect for pirates and other sailors who get too close for pistols or rapiers. Due to its small size, street thugs and thieves also appreciate this dagger because they can hide it everywhere. This dagger introduces a new handle to the Calimacil line-up. Curved and bronze in color, it is completed by a steel blade that is also curved. The result is a very dynamic dagger for quick slashing. All items made by the manufacturer "Calimacil" are hand-crafted in Canada. We´re always trying to keep every item in stock, unfortunately there may still be waiting periods up to 10 weeks for out of stock items. Disclaimer: All items shown here were especially designed to safely portray fights in controlled environments like liveroleplay events, theater stages etc.. These foam weapons are made with a glass reinforced plastic rod as a core, fully encapsulated in soft foam to avoid injuries.